You will want to have a tower cooling fan if you have problems with your kegerator pouring foam that requires you to pour a second beer immediately to get a good beer. The beer in the line inside your draft tower may not be cold enough. You will need a cooling fan for your draft tower. To build it yourself follow the simple instructions that follow below and you will be serving perfect pints in no time. No time to build it yourself? Click Here to purchase one. The first thing to do is confirm that your keg box is cold enough and that you don't have any mechanical or pressure issues that could contribute to foam problems. Furthermore, if your kegerator is a commercial model that is cooled with a cold air blower, you will not need to build a cooling fan. You'll simply have to capture some of that cold air and pipe it up into your tower. Most commercial kegerators are equipped to do this, you may simply need the proper hose to accomplish the job. 1. 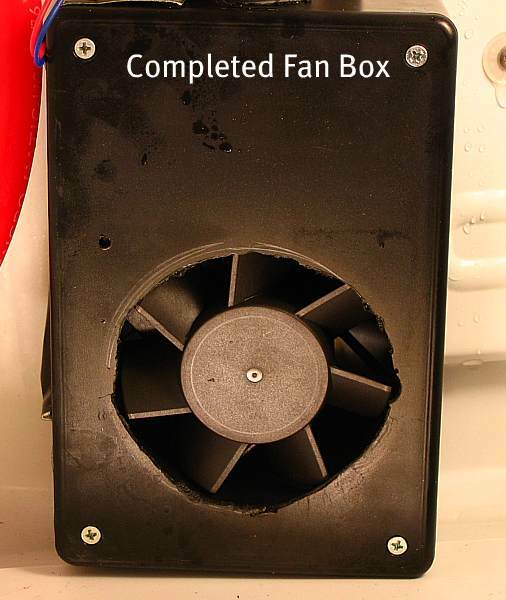 3" CPU fan (available at electronics and computer dealers). 2. A 6 inch x 4 inch x 2 inch plastic box with a removable cover. 3. An AC/DC power adapter with plug - with the correct voltage and amperage to match the requirements of the fan. 4. Crimp on electrical connectors for the size wire involved. 5. A 1 inch pvc male/hose adapter. 6. Five or six feet of 1 inch diameter corrugated blower hose with wire ribs (similar to vacuum cleaner hose). 7. 4 1 1/2 inch x 8 bolts w/ washers and nuts. Tools Needed: Wire crimping tool, 1 inch and 3 inch hole saws, power drill, phillips head screw driver, ? inch drill bit. 1. Drill the holes in the plastic box for the air inlet and outlet plus four holes for the fan mounting bolts. The inlet hole is usually 3 inches diameter and should be drilled with a hole saw on the large face of the box near the end. Be sure to leave enough room from the edge of the box to fit the fan in. The outlet hole should also be drilled with a hole saw and should be drilled on the short side of the box opposite the inlet hole. 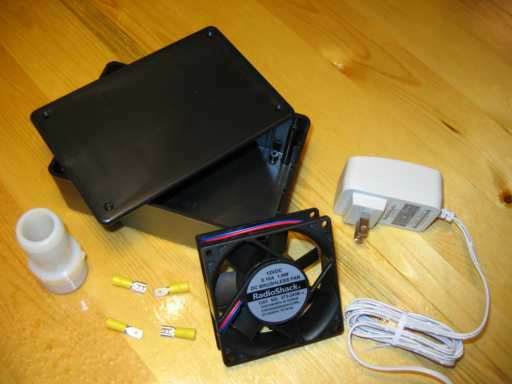 Insert the fan into the box and use the four mounting holes as a template to drill the fan mounting holes. Also drill a small hole on the appropriate long edge of the box to allow the electrical wires to exit. 2. Screw the threaded end of the hose adapter into the outlet hole. It may take a few tries to get the threads to dig in. Force one end of the hose onto the barbed end of the adapter. 3. Using the bolts, mount the fan into the box and push its wires through the wire hole. Make sure the fan is mounted so that it is pulling air into the box, not the other way around. Usually, there will be a flow direction arrow on one side of the fan. 4. In the kegerator box push the loose end of the hose up into tower from below. On many kegerator models you will have to expand the hole in the top of the kegerator box. (Find out how). Remove the top cap of the tower and peer inside to see that the hose has reached up to within a couple of inches of the faucet shank. If there is a lot of slack in the hose, cut the hose to the proper length (you want it to have as straight a run into the tower as possible). Keep in mind that the fan will reside in the rear of the box at the bottom or right up against the cold plate if appropriate. The coldest air in the kegerator is at the bottom. 5. Once the hose is sized properly, cut through about two inches of the plastic between the wire ribs and with a pliers bend the rib wire up and then form a hook in the wire at its end. This will allow the hose to hook onto the beer line or end of the shank to keep it in place. 6. You will have to decide how to bring the electrical wires into the kegerator to attach to the fan wires. It is possible to drill a small hole into the side of the box to run the wires through. Or you can run the wires out through the condensation drain hole. (Here's some other ideas for making holes in your kegerator). Another option is to bring the wires out through one of the upper corners of the door, using duct tape or small wire clamps to mount the wires inside and outside walls of the kegerator. This method, though the easiest, will compromise the door seal slightly and make your compressor work harder. How you do this will also depend on where your nearest available outlet is. 7. Once the wire is brought into the box strip all four wire ends and test the circuit by touching the wires together. The polarity of the fan will determine which end of the incoming wire will operate the fan. Once you have determined the polarity, you are ready to crimp the wire ends together to complete the circuit. Make sure the adapter is not plugged in while stripping and crimping the wires together. 8. At this point your assembly is complete. Place the box with the fan at the bottom rear of the kegerator or on the small shelf in the back is one is there. Face the air inlet towards the cold plate. Push the hooked end of the air hose up into the tower and hook the hook onto the faucet shank if possible or at least onto the beer line. Plug the adapter in and with the cap off the tower feel for the cold air with your hand. Of course with the kegerator door open all this time the air won't be at maximum cold. Wait a couple of hours and test again. With the cooling fan in place you will be able to pour perfect pints every time.